At some point in your childhood, your family owned a honey filled bear from the grocery store. A staple among most households. However, that honey filled bear may not have been honey at all. Shocking, we know! And maybe a little disconcerting. According to the FDA (Food and Drug Administration), a product that has been ultra-filtered and does not contain pollen, is in fact — not honey. Statistically speaking, it is evident that most of the commercial honey available to us (poor honey bear) contain minuscule amounts of pollen, if none at all. The presence of pollen is the only true indicator to determine whether the ‘honey product’ has its true identity. Unfortunately, through ultra-filtering commercial practices, honey is heated, more often than not — watered down with corn syrup, then forced through high pressure filters that remove pollen. On top of that, most commercial honey is pasteurized after it has been heated. When honey is pasteurized, it’s nutritional value diminishes. Destroying raw honeys nutritional content, including antioxidants, enzymes, and vitamins. Not only that — that sweet aroma that honey exudes, it’s buoyant flavor and deep color that we know and love is degraded due to these commercial practices. Companies started their ultra-filtering process in order to preserve honeys shelf life. Common sense tells us that any food product produced to last longer in the grocery store, probably isn’t the best thing for you. Even if the label suggests it is ‘pure’ honey, we highly recommended checking the back of the label to determine its true ingredients, or should we say — additives. Raw honey, counter to its commercial nemesis, is unfiltered, unpasteurized, and pure. Unlike commercial practices, raw honey is not heated and contains anti-bacterial, anti-fungal, and anti-viral properties that promote digestive health. If you are purchasing local honey, the pollen would be sourced from local plants in your area. This can assist with seasonal allergies caused from the same plants. Eating the honey that contains the allergen pollen can, in turn, combat those allergies. Raw honey has serval healing remedies and by buying local — you can experience the immense benefits of this sweet local delight. Commercial honey companies cannot guarantee, nor affirm, that their honey has not been exposed to contaminants. Purchasing raw local honey means you are ingesting local pollen. Knowing where your honey comes from can ensure what you’re consuming has not been subject to pesticides and chemicals. Therefore, if you do decide to do some research on a local raw honey alternative, it would be wise to ask the merchant what crops the bees will have been exposed to. 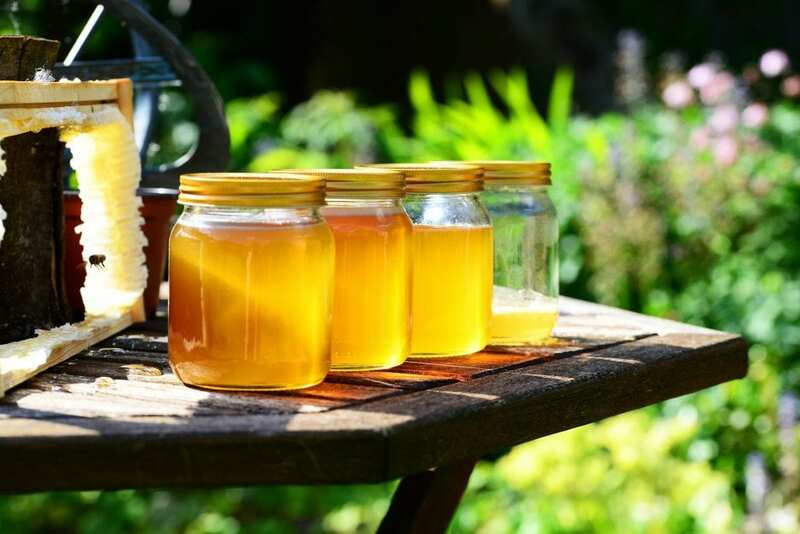 Although purchasing local raw honey has its health perks, it also supports your local beekeeper who is aiding the bee population and maintaining healthy bees and practices. A quick trip to your local Farmer’s Market may do the trick. You can also contact local beekeepers who could also point you in the right direction. There are countless resources available to buy local raw honey instead of shopping at your mega grocery store. And yes, it may require an extra outing or be a little more work — but the pay off both nutritionally and environmentally are substantial! On a personal note, our company has 100% pure raw honey available for purchase most of the year (as our supply can get a little low during winter months). All of our honey is harvested by hand and is NEVER boiled or watered down. Giving you all the naturally occurring enzymes, nutrients, and antioxidants you need! Please use the Contact Form to inquire about our delicious honey from San Diego Bees!